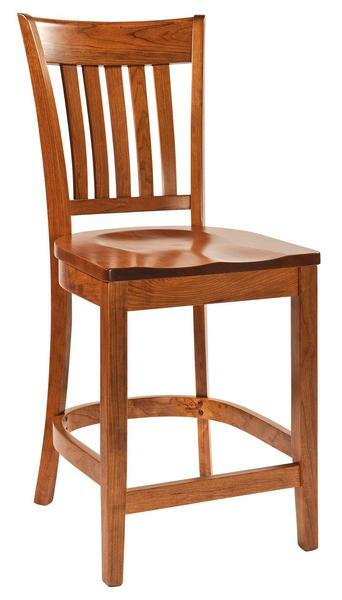 Warm and inviting, the Amish Harper Bar Stool offers a versatile seating option for your kitchen or dining room. Available in counter or bar heights, these Amish made bar stools are built by skilled Amish artisans to be both beautiful and strong for everyday use. A rich, wide seat back supports you as you sit, with comfortably curved stretchers displaying the solid wood you select. Make use of a spacious kitchen counter or convert your kitchen island into a dinette area. These solid wood bar stools offer comfort and an appeal that will have friends and family sitting in your kitchen for coffee and conversation! The Harper Bar Stool is shown here in distinguished cherry wood with a malaguania stain. Solid cherry wood is recognized for its strength and beauty and offers either a rich reddish-brown heartwood or a lighter, soft yellow-brown sapwood. Custom build these counter stools in the wood and stain of your choice. Consider solid wood seats or upholstered seats. We are happy to supply samples for your consideration. In the Bedroom: Use a bar stool in front of your dresser mirror to create the perfect vanity. Sit comfortably as you get ready for an evening out. In the Game Room: Provide seating for all pool players with solid wood bar stools or play cards at your pub table as you sit in style. In the Craft/Hobby Room: Work at your craft table seated high enough to reach for all of your supplies. We are here to answer your questions. Please call an Amish Furniture Specialist today at toll-free at 866-272-6773 or visit them at our brick and mortar store in Sarasota, Florida. Back Height from Seat: 19 1/2"
Shown in Cherry with FC-N3176 Malaguania Stain. Hi there - I just wanted to write & thank you for fixing our table so promptly! It was nice to not be hassled about it either. It gives us great confidence in your company to have any issues promptly & professionally rectified and we will definitely think of you again for future purchases.